These exercises were easy to prepare but I have to say I really didn’t see the differences mentioned in the coursebook. 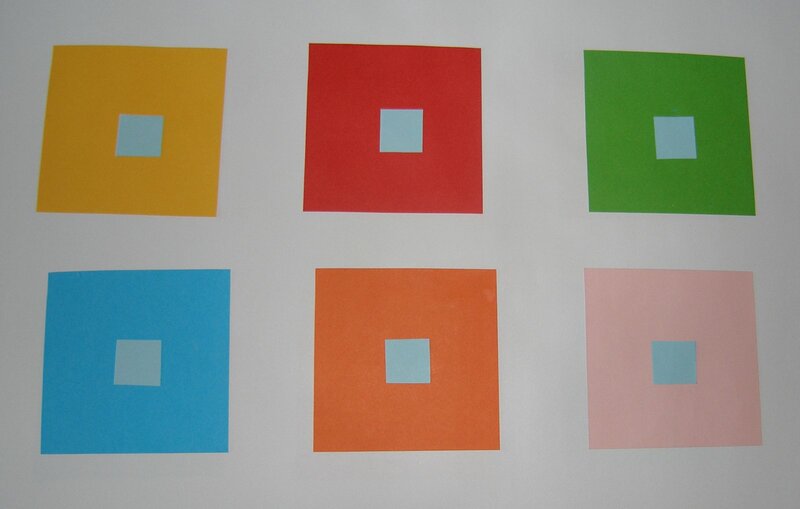 Six squares of coloured paper with a different colour square in the middle. 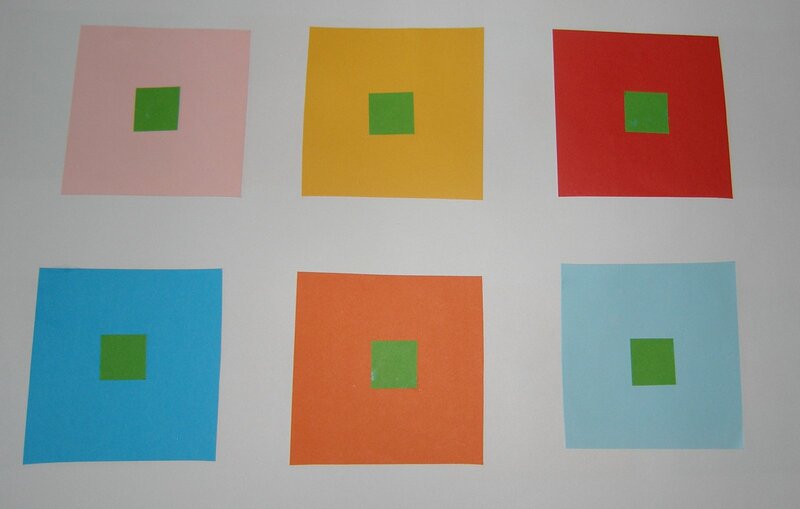 The aim is to look at the squares in the middle and see how the colour appears to change depending on the colour surrounding it. First with small blue squares in the middle. 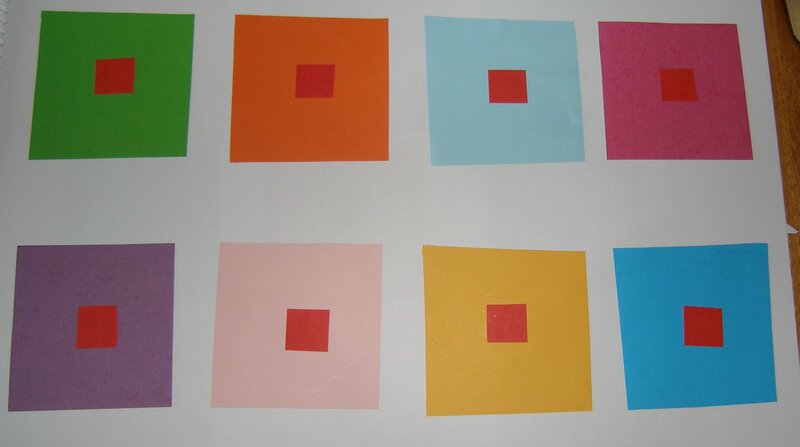 I think maybe the bottom left central square appears a bit more grey, and the one on the red seems brighter but I’m really not getting much else variation. Now for green squares. I can see a bit more difference in this example, the green square on the red background appears darker to me and the one on the orange background seems paler/washed out. Another try, this time red squares. 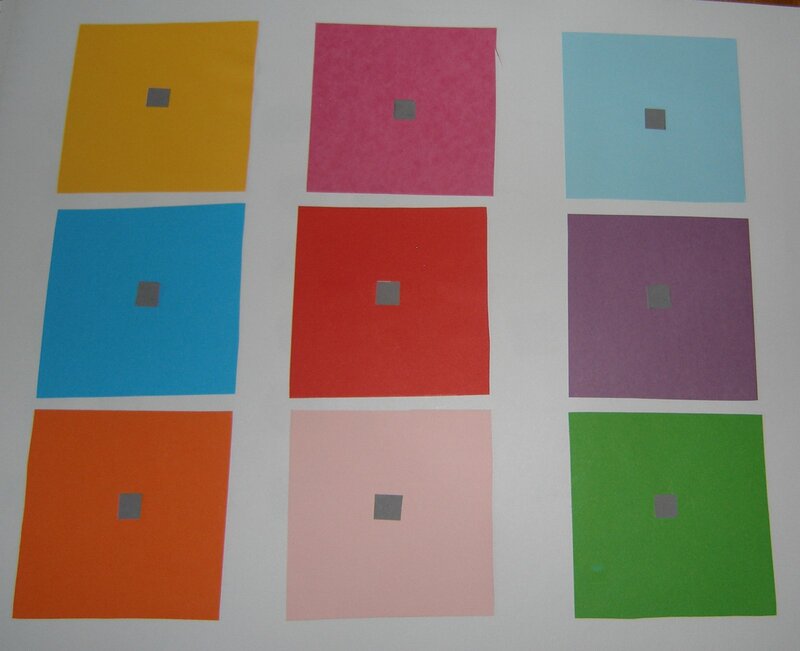 I can definitely see a difference with some of these, particularly the top row where the red on orange fades, on the light blue it is darker and pops out and on the pink it again fades. Now for little grey squares on different colours. The grey squares should be tinged with the complementary colour to the background in what is known as an ‘after image’. I just couldn’t get this one even after some serious staring. As I didn’t have any success with the after image exercise I had a look on the internet and found this site http://www.huevaluechroma.com/033.php which has an exercise on the Dimensions of Colour. I tried the exercises on the page and sure enough, I saw the after images.